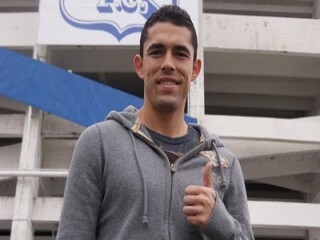 Herculez Gomez (born April 6, 1982) is a Mexican American soccer player who currently plays for Pachuca in the Primera División de México and brother of MMA fighter Ulysses Gomez. Gomez, the oldest of five children, was born in Los Angeles, California to Mexican-American parents. He grew up in Las Vegas, Nevada, and played on the soccer team at Las Vegas High School. Los Angeles-born Gomez could have played international football for Mexico as both of his parents hail America's neighbouring country, yet he had few doubts that his heart lay with the USA when he was offered the chance to play at the top level of the game back in 2007. Previously with LA Galaxy, Colorado Rapids and Kansas City Wizards, he joined Pachuca in Mexico after showing fine end-of-season form with Puebla and he has taken that rich scoring streak onto the international stage in the USA's World Cup warm-up programme. Scoring against the Czech Republic and Australia, Gomez confirmed he has the class to make a real impact at the World Cup finals, with coach Bob Bradley among those lavishing praise on his potent striker. "Confidence is such an important quality for a striker and Herculez clearly has plenty of it right now," Bradley said. View the full website biography of Gomez Herculez.